Now that all of my 2010 markets have wrapped up & my shop orders have no hope in arriving before Christmas, it’s time to get festive! Yum yum yum! I haven’t actually made this one myself yet, but it is tops on my list for this evening. 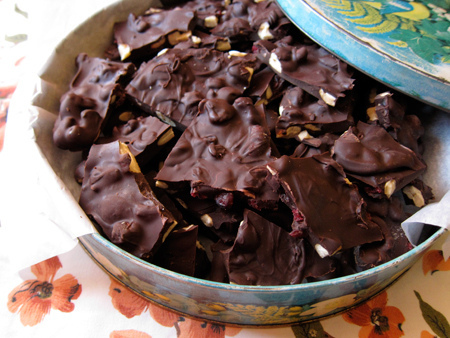 I’m heading down to Seattle for the holidays & have zero confidence that much any chocolate bark will arrive for sharing with the family. 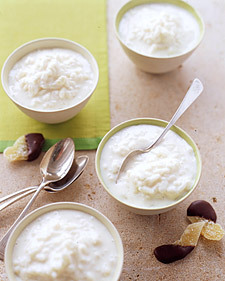 Rice pudding is one of my quick & easy go to desserts. The added ginger makes it a bit more special & less like hospital food. I’ll often sprinkle some nutmeg or cinnamon on top & rarely have “heavy cream” on hand, so coffee cream or half & half seems to substitute just fine. Combine rice, milk, sugar, fresh and ground ginger, and salt in a medium saucepan, and bring to a simmer over medium heat. Cook, stirring occasionally, until most but not all of the liquid has been absorbed and rice is tender, about 20 minutes. Remove from heat, and stir in heavy cream until combined. Serve warm. This is the recipe I baked alongside my mom when I was a kid & still love it today. The simple buttery goodness and dash of nostalgia make these easy to devour. After I’ve made the dough, I like to keep it in the fridge for a few days, rolling out a dozen or so cookies at a time. That way we always have fresh baked, warm from the oven shortbread. Yum! Cream butter & sugar together in a large mixing bowl. Add vanilla. Add flour a little at a time. 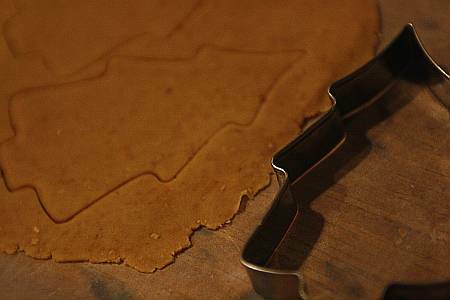 When you’re ready to bake, pull out a little at a time & roll between 2 sheets of wax paper. Then comes the fun part! Cookie cutters are the obvious choice, but I’ve had great success making little round cookies using a shot glass. Sprinkle & decorate at will. Transfer your shapes to an ungreased cookie sheet and bake for 20 minutes at 300 F.
Traditional shortbread uses white sugar, but I’ve used brown sugar too & it’s just as tasty. In the photo above I used brown sugar and whole wheat flour which made them feel a bit more substantial & not quite as melt-in-your-mouth flaky. Have your own favorite holiday recipes? I’d love to hear ’em!